She’s cooked for royalty and has a fierce social media following,. Star chef, Bridget Davis definitely knows her onions. In this wittily named cook book, 128 Recipes That Saved My Life…Or At Least My Dinner, Bridget includes stories from the kitchen front line and never fail recipes. As a working mum, who’s spent over 25 years working in professional kitchens, this self-confessed butter addict, also knows the value of getting food on the table and making sure it’s appealing. 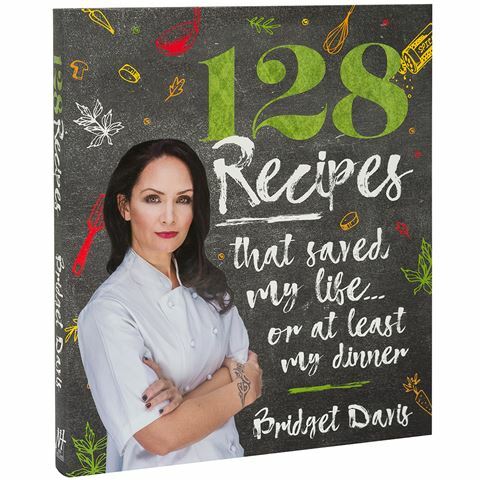 The book is filled with easy recipes including No Fuss Scones & Honey Butter, Cheat’s Bearnaise Sauce and 10-Minute Baked Chocolate Puddings. In short, this is a book for how we live now. Recipes also includes beauty treatments.